Group Events are a great way to bring friends, family, and coworkers together for a truly unforgettable outdoor experience. We’ll give you a discount for booking 7 or more. Help your co-workers escape the ho-hum of the office. Drag the neighborhood kids away from their screens for an afternoon. Save a few bucks by bringing yourself and 6 of your most adventurous friends. And most importantly, be known for gathering your group for a unique, adrenaline-pumping adventure unlike anything else around! What Times Are Available to Schedule Groups? Thinking of bringing a large group? The more the merrier! During the fall and spring seasons, our park is not open for general admission, Monday – Thursday. 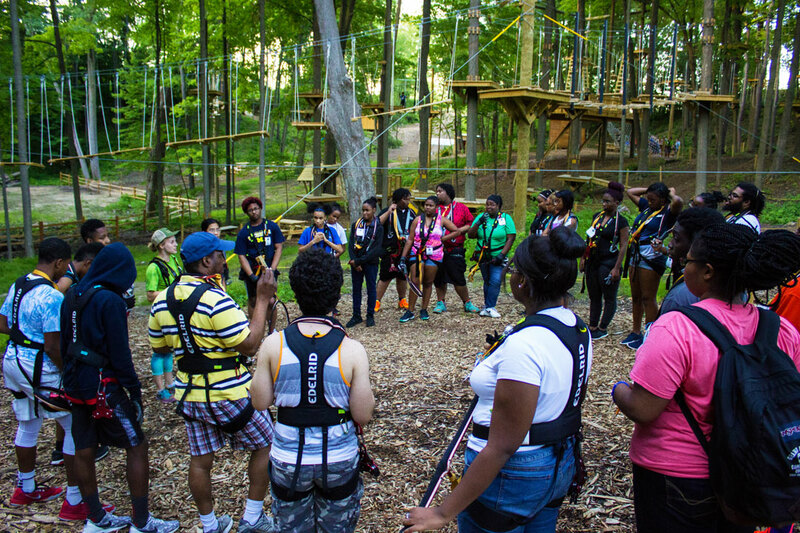 However, we are happy to open the park for groups of 12 or more for an exciting day of climbing in our treetops! Group sales are also available on the weekends for 7+. Discount rates apply and advance reservations are required. The Park is open 7 days a week for groups! Groups of 7+ can make advance reservations and discount rates will apply. Dates and times are subject to availability. Yes! Please visit our Catering Page to find out more. A notice of 48 hours in advance is required to cancel or reschedule groups. The deposit is non-refundable but may be used to reserve another date due to weather cancellations. TreeRunner Grand Rapids is open rain or shine, we recommend you dress for the weather. If you do not care to climb in the rain, you may reschedule your reservation for another day. In the event of severe weather (such as thunder, lightning, or high winds) the trails may be closed. Although we are unable to offer refunds, in the event of any trail or park closures, your time may be extended, or vouchers will be available for you to use towards future climbs. In cases of extreme weather, we do close the park. Due to the unpredictability of the weather in our area, on occasions, we are unable to make a weather call until very close to a group start time. If you have any concerns or questions the day of your climb, please call us at (616) 226-3993. We would be happy to address any questions or concerns you may have. All waivers must be signed before arrival to the park. If all waivers are not signed before arrival to the park, the entire group must wait for entire group’s waivers to be signed before entering the park. However, in this instance, your climb time starts at your reserved time and if we are waiting for waivers we will not be able to extend your time. If you are worried about it, we recommend arriving at least 15 minutes before your scheduled time to be able to check in, use the restrooms, etc. A final guest list is due 48 hours before climb time. This is the guest list we will use to check that all waivers are in our system. Any missing waivers will need to be filled out before the group may go down to begin their climb. Closed-toed, securable shoes are required. We recommend comfortable and loose-fitting clothing. Long hair must be pulled back. No hoop earrings or dangling jewelry or scarves. 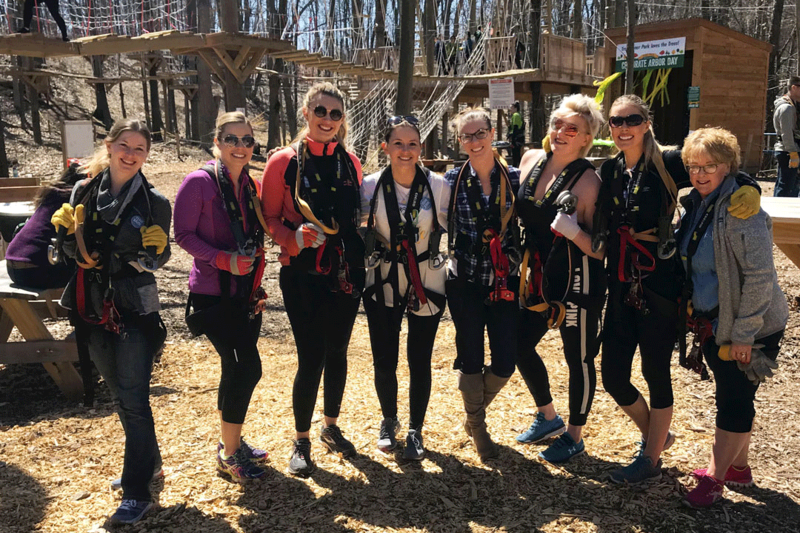 At TreeRunner, we can cater to the unique needs of your group and create a one-of-a-kind experience. We accommodate groups both large and small. Our Park Guides safely and efficiently facilitate groups to get them skyward in a timely manner. Notice their great attention to detail and professional interaction with your group during ground facilitation and throughout your stay. Our wooded, serene setting is unlike any other in Grand Rapids. Picnic tables and benches line the wood-chipped paths beneath an aerial obstacle course and zip line park. This provides an exciting place to observe and meet with your group before or after exploring the course yourself. Some groups prefer to climb together, while others prefer the independence of climbing at their own pace. We start everyone on one beginner course, or for larger groups, the two easiest courses that run side-by-side. From there, individuals choose their level of challenge. Some may choose to stay at the beginner courses and hone their skills. Others may choose to push themselves further on one of our intermediate or expert-level courses. Most importantly, we strive to give each guest a satisfying and challenging experience that meets their highest expectations.